15 years ago, my father lost his job and it almost ruined him. He had always had a job (if not several) since he was a teenager, but his contract job with a fax machine repair company was eliminated just before I left for college. 1994 was also the year Mom got breast cancer. It was a rough year for us all. When you suddenly don't have a job after 40 years, it can really turn you on your head. Dad had a very hard time adjusting. There was talk of getting rid of the pets because we couldn't afford them anymore, selling anything and everything we had and other gloomy premonitions for us all. Over time, though, he rallied when he realized we would indeed make it and eventually his contract job asked him to come back. But it was a long year or so in between. 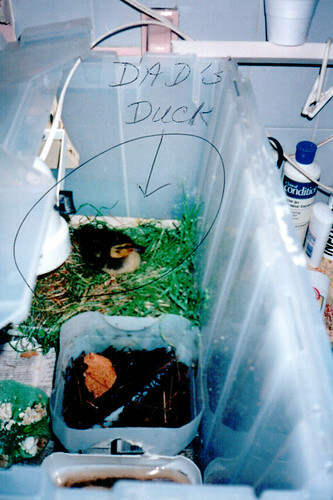 During his period of unemployment, my father discovered a sickly duckling in the yard. I'm not sure where she came from or how she was injured, but Daddy took her in. He fashioned her an outdoor pen but because the raccoons might get her after dark, she spent the nights in my parents' bathroom. My mother brushed her teeth each morning with a duck to keep her company. Because I was away at school, Mom sent me pictures to chronicle the progress of Dad's patient. The duck apparently had some sort of inner ear problem that made her fall over and unable to walk well. If you put her in water, she would immediately capsize and would have drowned if not rescued. 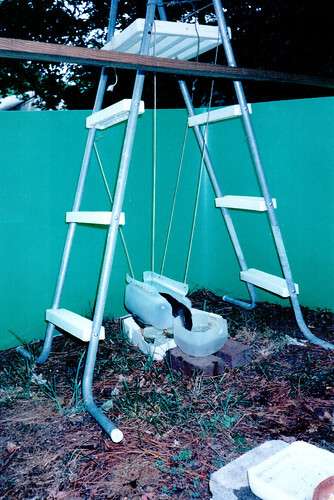 So my father designed a sort of duck traction device out of a 2 gallon water jug and old pool ladder to keep her upright and encourage her to paddle. There were several versions of this device, but they all seemed to help in her water therapy. 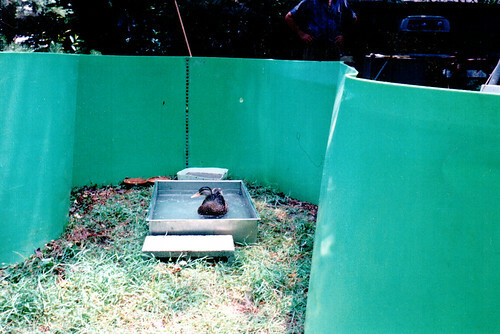 Eventually, the balance issue resolved itself and the duck could again eat, drink, waddle and swim. Unfortunately, as the weather turned cold, we also discovered that the duck could fly. She flew south that winter to migrate with her fellow kind, leaving my father behind. We worried that Daddy would get depressed once his duck had disappeared, but he seemed content enough that the duck recovered and adapted back to the wild. He did mention once, though, that if he ever found another sickly duck he might clip its wings so it would stick around a little longer.